Today we are happy to share a quick interview we conducted with owner-operator, veteran, writer, coach of Freightliner’s elite Team Run Smart community, and all-around trucking hero, Mr. Joey Slaughter. Joey is the owner of Blue Ridge Transport, LLC, a Ringgold, Va.-based step deck carrier. Since 1992 Joey has operated dry vans, reefers, gasoline tankers, hot shots, doubles, and car haulers. He is an honor graduate of Liberty University (go #Flames) with a Bachelor Degree in Religion, and a U.S. Army Veteran of Operation Iraqi Freedom. Today, he’s an interviewee. Here’s some wisdom and insight he shared about being an owner-operator in today’s complicated trucking landscape. RR: What would you say are the best (and worst) ways to recruit owner-operators? JS: The best ways would focus on letting the owner-operator have the most freedom with when to work, and choosing the loads they want. I would also highlight the support that a company can offer an owner-op, like consistent freight, paid plates, insurance, IFTA filing, no charge quick pay, etc. The worst ways to recruit would be communicating to owner-ops that they would have to compete with a company truck. Too much oversight also drives good owner-ops away. It’s a fine balance. RR: For someone trying to reach owner-operators, what platforms or channels would you recommend? JS: Owner-operators can be found in information sharing sites on the web. We’re always looking for knowledge about business, finances, other types of trucking, etc. Forums, Facebook groups, etc. RR: When it comes to choosing which company you work with, what’s the hierarchy as far as what’s most important to drivers? 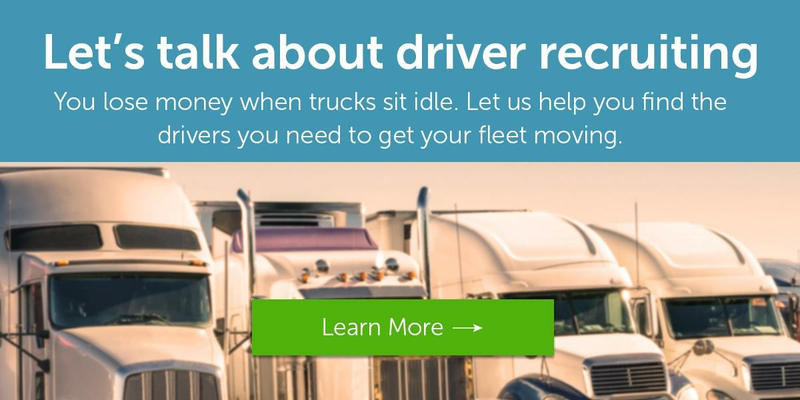 RR: What can trucking companies do to attract, recruit, and retain more veterans? JS: I am a veteran and I was impressed to see trucking companies travel all the way to Germany and recruit soon-to-be veterans for their companies. Veterans like structure, organization and clear channels of communication. A company looking to recruit more veterans must possess these things. RR: Over the years, what issues tend to cause the majority of your headaches on the road (or off)? JS: Parking, lane restrictions, high prices at truck stops, excessive regulations. RR: What would you say are the biggest challenges facing owner-operators right now? Any ideas on how to make positive change happen in the industry? JS: ELDs and the uncertainty of future operations. RR: How do you make purchase decisions when it comes to equipment? How do most owner-operators you know go about buying equipment? JS: I calculate the ROI (return on investment). Will this product or service save or make me money in the long run? Buying cheap is usually the wrong decision in my experience. RR: What advice do you have for younger truckers looking to become owner-operators? JS: Run your company truck as if it’s yours. Gather the information needed and learn to calculate your cost-per-mile. Most people overestimate what they’re going to make and underestimate the costs involved, so keep that in mind. You don’t want to paint too rosy of a picture when forming a business plan. RR: What’s been the secret to your success? What are some ways to get ahead as an owner-operator to pursue excellence and efficiency? JS: Stubborn determination has been the secret to my success. For more insights into Joey’s operation, and for the latest on pressing issues facing owner-operators in 2017, be sure to follow his Team Run Smart blog.